Fiberglass windows prices vary between $350 and $850 for each window fully installed. The prices are determined by the type of window you need, the frame, the size, the installation, the manufacturer and the glass package you choose. We have put together a general idea of the prices you may be quoted on three packages - for more cost information, see our replacement window cost calculator. 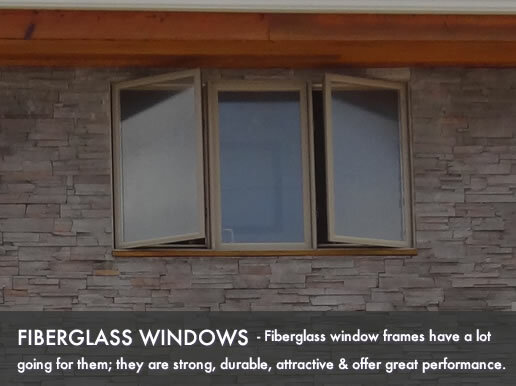 Entry level fiberglass windows prices vary between $200 and $300 for each window. They are normally available with double paned and a low end low-E glass options. The frame can be either a single horizontal slider, single hung or fixed frame. They will be a stripped down version of a mid to high end options and will lack the same glass package, fills, spacers and optional upgrades that may come on these more expensive options. Standard fiberglass windows prices usually include a wider array of window types, they can be double hungs or casements. You'll find you will also be offered a higher energy efficiency glass package which may include a low-E glass with krypton or argon fill and decent low U and R factor. Higher end fiberglass windows prices can range from $400 to $600 and are usually available through the well-known manufacturers. The windows are often the higher end casement options which you can get from Marvin and Serious, to name a few. The glass package will probably be a good low-E glass with a top SHGC number and U factor. Most high end fiberglass options include a choice of upgrades which may include metal hardware, rail reinforcements, superspacers, etc. Installation pricing can vary anywhere from $75 to $250 for each window. If your project is simple and requires an insert or some work to the stops and sills, you can expect to pay between $50 and $150. Iif there is major work required to ensure the new window fits correctly, you can expect to pay anywhere between $150 and $250 for each window. For complete project estimates, try our replacement window pricing calculator. Buget window prices for fiberglass frames start at $350 and top out at $500 for each installed window. Average replacement window costs for fiberglass frames start at $500 and top out at $700 for each installed window. High end windows prices for fiberglass frames start at $700 and top out at $900 for each installed window. These windows include Marvin Infinity, as an example.